Halloween is a time for a spooky look, and now with this collection of Scary Horror and Gothic Costumes, you and your children can get the perfect style for scaring! There are reapers and zombies, witches and psychos, vampires, creepy jesters, and many more, as well as accessories that make your next costume party or trick-or-treating perfect! Bloodsucking vampires, howling werewolves and all other things that go bump in the night have inspired stories and nightmares for centuries. They send chills down your spine and tap into your deepest, darkest fears. Instead of always running from the monsters, embrace your fears and become one of the monsters for your next special event. With our terrifying collection of scary themed costumes, you can transform into a wicked witch or sorcerer, a dangerous bloodthirsty vampire or even death itself, the Grim Reaper. You can topple over friends as Frankenstein’s monster, leave a haunting impression as a ghost or play tricks as an Evil Jester. You’ll create thrilling memories no matter which character you choose. Character Bios - Who Will You Scare? Vampires are seductive, charismatic bloodsuckers who roam the darkness for unsuspecting prey. Command your next special event as the ultimate villain of the night and watch as people line up to offer you their blood. This Victorian lady has evaded the afterlife and now spends her nights as a ghost wandering among the living. Not only will you leave your friends spooked with this costume, but you’ll haunt their imaginations long after the party ends. Dr. Frankenstein’s monster is a classic horror-story character and the perfect inspiration for your next event. Partygoers will tremble in fear as you stomp and grunt your way through the crowd dressed as Frankenstein’s grotesque creation. As the ruler of the Underworld and mastermind behind all sin, the devil is the epitome of evil. 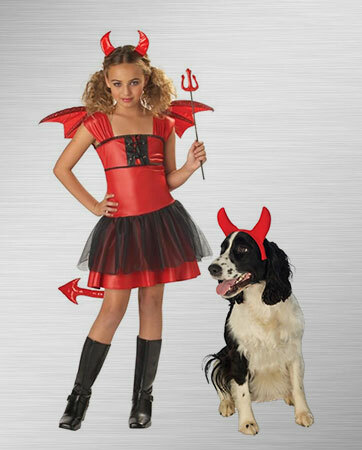 Enjoy a night of temptation and destruction when you attend your next event as the devious devil. Zombies are undead human corpses with an unsavory hunger for human flesh. Join the ranks of the mindless undead and send your friends into a frenzy when you show up to the next party ready to feast on human brains. Once a month, streets empty and doors lock for fear of the wild beasts that wander under the light of the full moon. For the next special event, watch your child shift from human to terrifying monster right before your eyes. The Grim Reaper is the personification of death. He comes for everyone sooner or later, collecting each soul with a swift cut of his scythe. As the Grim Reaper, you can wield the power of life and death at your next party. The classic, lovable entertainer has gone awry. No longer in the business of laughter and joy, this jester operates only in deadly tricks. Give your friends nightmares when you show up to the party as a master of manipulation. 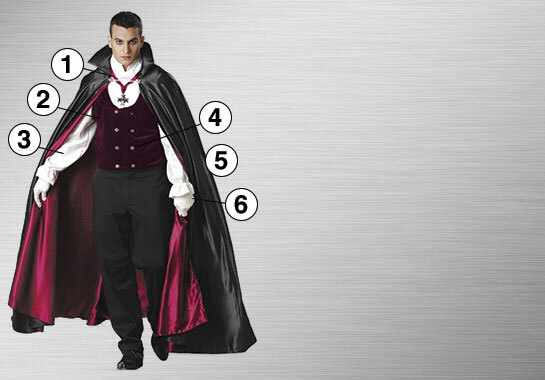 If you’re in search of a spine-chilling group costume, a vampire theme is the perfect choice. 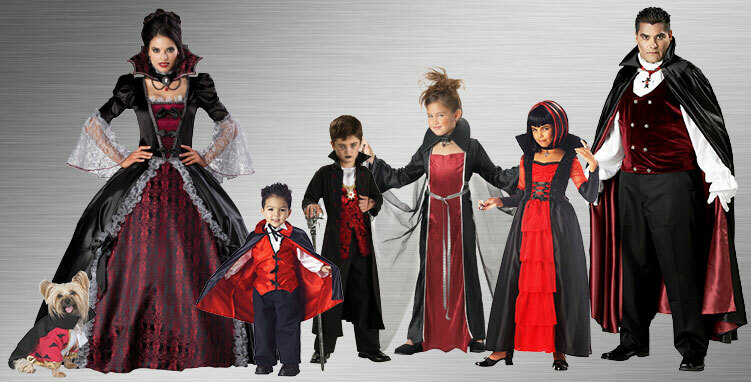 With costumes for adults, children and toddlers, our collection of vampire attire can transform the whole family into a terrifying, bloodsucking coven. Different styles of costumes give your coven plenty of options to choose from. You can achieve the traditional vampire look with the Gothic Vampire Elite Collection or aim for a more refined, Victorian-style coven with the Vampire and Vampiress of Versailles designs. No matter the style, your group is sure to dominate any special occasion when dressed as these powerful monsters of the night. 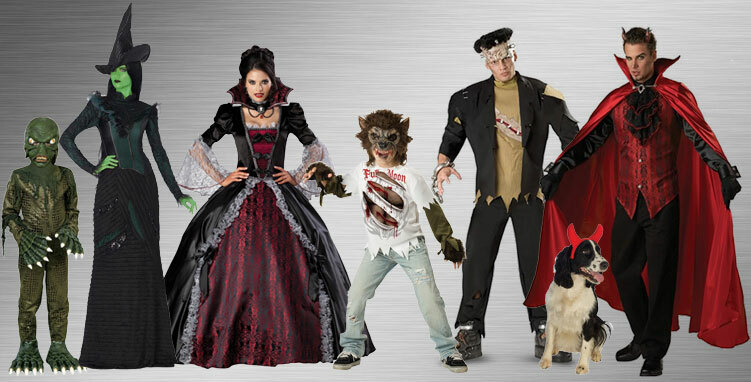 With the Deluxe Vampire Dog Costume, your pup can join the party, too, and complete the look. Inseparable in life and death, these Victorian elites continue their romance as a ghostly couple. 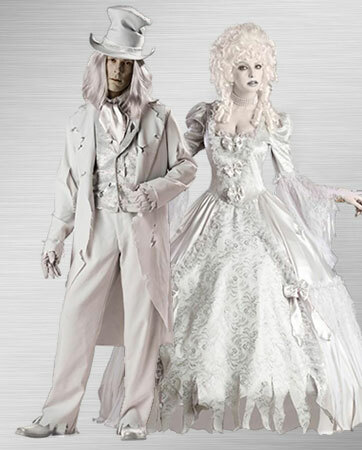 The haunting pair is a perfect costume choice for you and your eternal love at your next themed party. 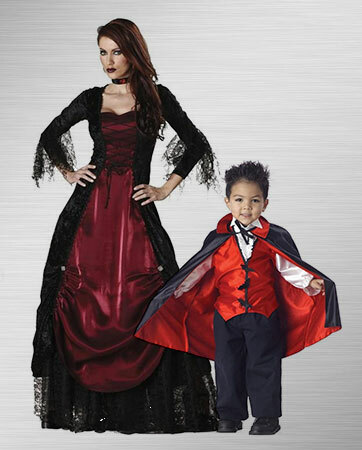 You and your child will be the center of the party when you show up as a dangerously cute mother-son vampire duo. Keep your little Dracula-in-training close, though, or he might cause trouble with his growing fangs. 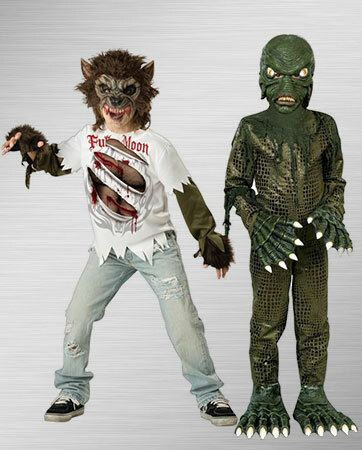 Both the swamp monster and werewolf costumes will leave your children unrecognizable, an advantage for them as they begin their night of tricks and torment. Your children are sure to frighten at the next special event. Even the Prince of Darkness needs a best friend to keep him company in the Underworld. With these devilishly adorable outfits, your child and horned beast will be an unstoppable duo on their quest to corrupt lost souls. For a seriously spooktacular look, take your vampire costume to the next level with the Gothic Vampire Elite Collection Adult Costume. When creating a winning outfit, you can’t skimp on the details, and this costume doesn’t hold back. A burgundy velvet vest with silver Gothic buttons, white satin sleeves and white gloves give the look an elegant flare fit for a debonair vampire on the prowl. A jeweled medallion with a red satin ribbon that oozes ancient European royalty and a black satin full-length cape complete the Gothic-styled outfit that will chill spines and weaken knees. When it comes to finding the most chilling costume for your child, nothing is more terrifying than death itself – the Grim Reaper. With the right accessories to complete the look, your child will have everyone running for the hills as they try to escape death’s call. Start with a pair of black boots to match the black cloak. Then add a Giant Sickle, the handy tool every Grim Reaper needs for collecting souls. 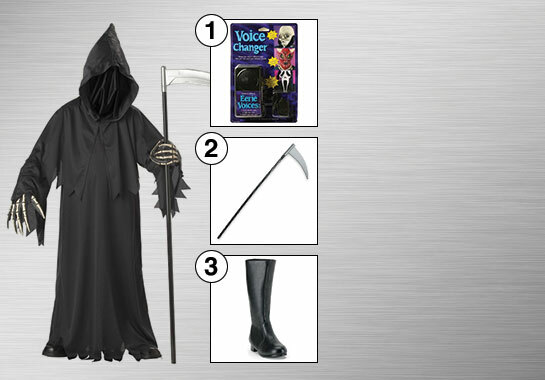 For a truly unnerving Grim Reaper, complete the costume with a Voice Changer, giving your child a voice as chilling as the appearance. For zombie costumes, the most crucial element is the makeup. The right makeup enhances every zombie story, so you don’t want to skimp on this part of the look. With these tutorials, learn how to create a masterfully gory zombie appearance with incredibly realistic facial wounds and bloody fingernails worthy of any horror movie.